After 40 years of protecting fisheries for the long term, commercial fishermen express concerns about proposed changes to their home port. Captain Kelly Fukushima is in a good mood, bustling between fellow fishermen and customers eating tuna tacos at his stand. The open-air Dockside Market in San Diego’s Tuna Harbor, which required an amendment to state law to open, had nearly 100 customers waiting in line before it opened at 8:00 a.m. on a recent Saturday morning. It got busier as the morning went on. The bustling market is a welcome sign of life for San Diego’s commercial fishing fleet, which has been struggling under four decades of the tightest fishing regulations in the world. The Magnuson-Stevens Act of 1976 enacted gear restrictions, reductions in allowable catch in fleet capacity, and rotating fishing area closures (like letting a fishing ground lie fallow). While the regulations have succeeded in rebuilding California’s depleted fisheries, the industry has yet to fully recover. After the passage of Magnuson-Stevens, near-shore boats diversified their catch, creating an urchin fishery and finding outlets for other local species like rockfish, blackcod, perch, halibut, leopard shark, mackerel, dorado, opah, rock crab, and bluefin and albacore tunas. 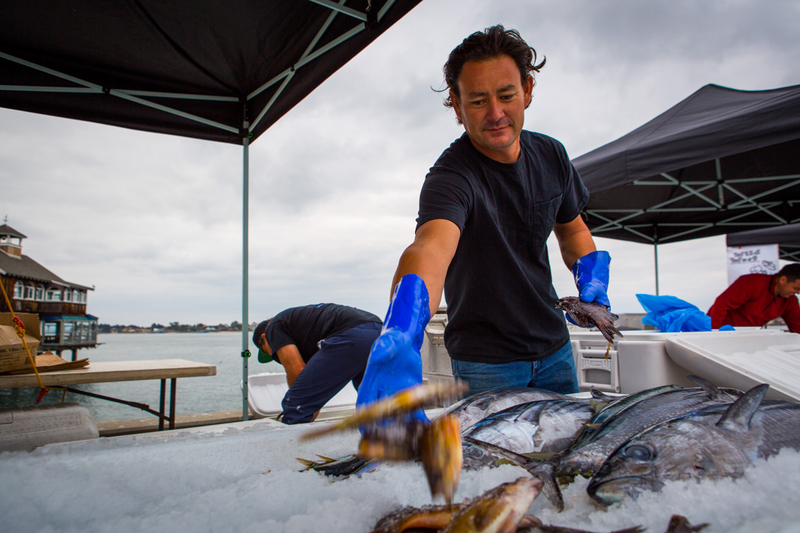 And with the opening of the Dockside Market in 2015, San Diego’s fishermen can now sell directly to the public. Fukushima says the direct sales aren’t keeping them afloat, but that the face-to-face interactions “are a huge benefit.” He credits the Dockside Market’s visibility for an increase in local demand for his fish, which has allowed him to raise his wholesale prices as well. Just as local foods are growing local economies around the country, fisheries from Louisiana to Boston to California’s 840-mile coastline are boosting seaside communities. 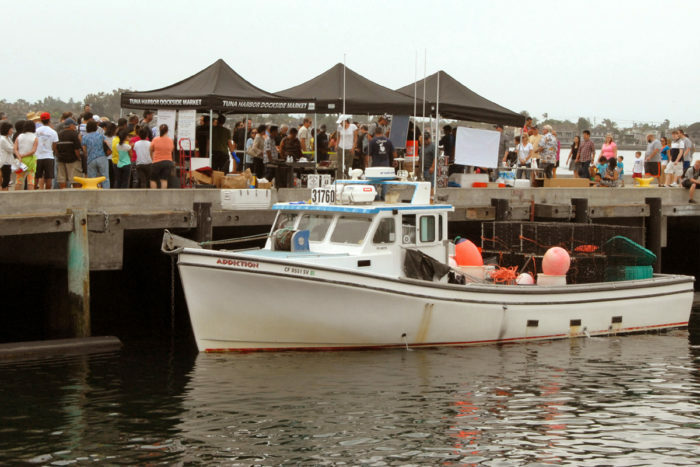 But for all of the momentum that the market has given the fishing fleet in providing revenue, interaction with, and education of local consumers, the Dockside Market’s future is uncertain. San Diego’s Central Embarcadero, which includes Tuna Harbor, is in the midst of a redevelopment process that could threaten the fleet’s ability to operate. Currently the Central Embarcadero includes the commercial fishing harbor, a park, a few restaurants, a run-down shopping center, and undeveloped lots in various states of ruin. Redeveloping San Diego’s waterfront has been in progress for two decades; various setbacks in other parts of the waterfront have stagnated many of the original plans, but long-vacant structures are being demolished and new parks are appearing. In an attempt to redevelop the area, the port of San Diego has accepted a proposal from development company Gafcon, which proposes filling the port with attractions like an aquarium, hotels, beaches, a permanent farmers’ market, and a yacht marina. The drawn-out process has resulted in a number of different versions of the development plan being circulated, and the latest iteration of the redevelopment plan, the Central Embarcadero will be zoned as “mixed use 2,” an unclear designation that has Fukushima and others dependent on the fishing fleet worried. As in other cities around the country, revitalizing the waterfront promises to attract tourism as well as local customers. However, the possible development of Tuna Harbor has people nervous that the fishing fleet will be pushed to the side, and rumors are flying about collusion and profit seeking. Gafcon’s Central Embarcadero development plan has been in drafting since July 2016. Early negotiations between Gafcon and the fishing fleet included an agreement that Tuna Harbor would be protected from any changes to its zoning and intended use. But the port authority’s decision this spring to adopt the “mixed use 2” overlay looked much like the original proposal to mix recreational yachts with the fishing vessels in Tuna Harbor, causing congestion that could make the harbor useless for commercial operations. As a result, the fleet and its advocates are crying foul, reminded of the private meetings and illegal changes made to a previous master plan that upended redevelopment of the North Embarcadero and strained the public’s relationship with the port. Lesley Nishihara, senior planner for the port authority, understands the fishing fleet’s trepidation. “There have been a number of things over the past two decades that have caused some mistrust,” she said, in reference to the redevelopment of the North Embarcadero. But Nishihara is quick to explain that Tuna Harbor will have its own policy language dictating how the space can be used, that this language will protect its functionality, and that the mixed-use overlay was employed to allow for a possible expansion of Tuna Harbor. She noted that they would not be mixing recreational and commercial vessels under any circumstances. As the Central Embarcadero redevelopment plan proceeds, San Diego’s fishermen want to hold on to the progress they’ve made in recent years, stepping up direct sales by making the Dockside Market more permanent and expanding the fleet. The local captains now better coordinate their catch to avoid overlap at the market. Urchin diver Peter Halmay described the fleet’s group text with various threads of “who’s fishing for what” harvests and a more concerted effort to educate consumers on how to buy and prepare different kinds of fish depending on what’s in-season. The Dockside Market has shifted the way San Diego’s fishing fleet reaches its customers, taking cues from land-focused farmers’ markets and mirroring efforts by fishing captains across the state and around the country to re-train the public how to eat fish beyond shrimp, tuna, and salmon. “I call it my urchin garden, I know what’s out there and where it is and how much I’m going to take before I leave the dock,” Halmay said. He uses farm analogies frequently to stress that local seafood has the same economic and environmental potential as consuming locally produced land food. Although the Port and California Coastal Acts protect the harbor’s size and functionality in theory, even under the best of circumstances, waterfront zoning is hard to pull off successfully. There’s no one right way to redevelop a port. When asked about other cities that she looks to for examples, Nishihara dismissed the idea with a joke about a (nonexistent) “textbook on port redevelopment” that she keeps in her office. However there are a number of similar and successful projects around the country. The National Oceanic and Atmospheric Administration (NOAA) has pulled together a list of 10 best practices for smart coastal and waterfront redevelopment, highlighting cities that have incorporated those practices. Portland, Maine, for all its obvious differences from San Diego, undertook a similar adoption of mixed-use overlay as part of an effort to revitalize dilapidated waterfront infrastructure that their commercial fishing fleet depends on. Nishihara said that she knew about Portland’s project but that she didn’t pay much attention to it. NOAA now uses Portland as a case study for effective waterfront employment of mixed use zoning. The piers are well-maintained and provide adequate berthing and access for the lobster boats as well as office space for low-volume businesses, while bars, restaurants, stores, and their customers are kept on the main streets. What active management looks like is different for each case. Needelman said that Portland’s biggest challenge is addressing strain on infrastructure from pedestrians and non-marine vehicles. The traffic is congesting work zones and causing unforeseen wear and tear that affects the commercial fishing industry’s ability to operate efficiently. According to Needelman, this is not a site-specific threat. If San Diego’s redevelopment is successful in attracting more pedestrians, commerce, and tourism the resulting pedestrian congestion could meaningfully inhibit fishing operations. 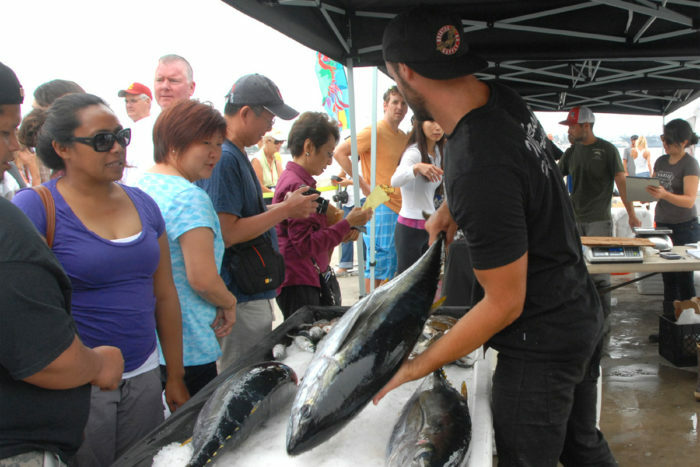 Having worked extensively with city officials on the 2015 “Pacific to Plate” bill that allowed them to open the Dockside Market in the first place, Fukushima said he and the San Diego fishing fleet are proceeding with what Fukushima describes as cautious optimism. Though the redevelopment process operates on a larger scale, and there are huge amounts of money at play, Nishihara has assured fishermen that they are central to the redevelopment. Fukushima and Halmay, with their experience working with the Coastal Commission for the Pacific to Plate bill, are ready to believe her. As the city’s fishing fleet continues to evolve, the fishermen hope they can even better fit into the Port’s simultaneous evolution. Kelly Fukushima photo (at top) courtesy of the San Diego Food System Alliance; Dockside Market photos courtesy of the Port of San Diego.